We all love having a wonderful vacation and there can only be one which we will most remember for the rest of our lives. Which vacation am I referring to? A honeymoon of course! People often spend months, if not a year or more, on planning the actual wedding day, so why not put the same kind of time and energy into planning the honeymoon? Once children are added to the equation, vacations might not come along as easily, so this should be the one time when you splurge and thoroughly enjoy this romantic time together. And what could be more romantic than spending your honeymoon on a luxury honeymoon yacht charter, maybe in the Caribbean? A honeymoon yacht charter will surpass all the romantic dreams you have had about this special time in your life. What could be more romantic than watching the sun set over a crystal clear blue sea with a warm breeze caressing your shoulders? The Caribbean must be one of the most romantic destinations in the world, and so to combine that location with a luxury honeymoon yacht charter will certainly result in the most memorable vacation. When on board your honeymoon yacht charter you can take the opportunity to really relax and unwind from what has been one of the most stressful times in your life. Kick back and enjoy the sunshine, or alternatively you could opt for something a little more active, such as windsurfing, water skiing or wakeboarding. And should you wish to try some snorkelling, you will find the waters are extremely clear in this area. Your vision will be great as you take in the highly-colored fish which abound in the ocean. No matter how you wish to spend your time, you will be spending it in the lap of luxury aboard your honeymoon yacht charter in The Caribbean. The British Virgin Islands is also another idyllic location for your honeymoon yacht charter. You could go on an island tour and really appreciate the stunning surroundings of this beautiful part of the world which enjoys year-round temperatures of 75-85 degrees. And before you join the crew on board this super honeymoon yacht charter, you will be asked to present the chef with a list of known allergies as well as your personal food preferences. This enables us to ensure that you will receive restaurant quality food to suit your tastes. Whether your personal favorite is something exotic such as pate de fois gras, or a simple grilled fish, your on-board chef will prepare it for you to the highest of standards. 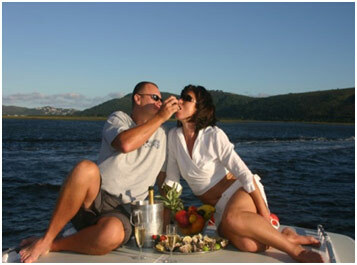 Your honeymoon yacht charter will be fully stocked with all your favorite food and wines before you even climb aboard. All in all, we want to help you to have the most memorable time in your life. Honeymoons come along only once, (hopefully!) so why not make yours the best it could possibly be by chartering a honeymoon yacht in The Caribbean?